In 1708, Leicester tried, unsuccessfully, to promote a parliamentary act for establishing a town workhouse under the management of six Guardians drawn from the town's six main parishes. Similar attempts were made in 1792 and 1810 but neither succeeded. Instead, each parish resorted to setting its own establishments for the relief of the poor. In 1714, St Margaret's erected several "parish houses" for accommodating the poor but not providing or requiring work. These were enlarged and converted to a workhouse in 1723. They first made Choice of a Master, who has the immediate Care of the Poor, to keep them in Order, and employ them in such Work as they are capable of, and see that their Food is duly prepared and given to them, &c. He has two Apartments assign'd to him, his Diet and Washing, and 12l. per Annum Salary. The Parish Overseers buy all things	for the House, and the Poor in it : For their Cloathing, they buy whole Pieces of Woollen and Linnen ; which, when cut out, is made up into Cloaths, by such of the Poor as are capable of it. The Overseers, about once in a Month, send in five Strike of Malt, which the Master brews at once into good Drink ; and every Saturday the Overseers buy for them a sufficient Quantity of good wholesome Meat, and send it to the Master. If any of the Poor fall sick, a proper Provision is made for them, and some of their Fellow-Poor are appointed to attend them. They are all confined within the Precincts of the House, and are not to go out of it without Leave of the Master; if any of them have Imployment abroad, they are obliged to return in a due Hour ; and whoever imploys them, agrees with the Master for the Wages, and pays them to him ; which, together with the Product of the Labours of the rest, he delivers to the Overseers every Friday in the Evening, who then take the Accounts from the Master; and add out of the Parish-stock, what is wanting for making Provision for the following Week. The general Method for employing them (besides what is abovementioned) is in spinning Jersey ; such as cannot spin, are set to knit Stockings for the rest, and one is appointed to teach the Children to read. The Time of working is twelve Hours in the Day, Winter and Summer. The Number of the Poor at present is 28, viz. 16 old, and 12 under 8 Years of Age. The Product of their Labours, one Week with another, is about 14 s. the Charge of maintaining them weekly is about 40 s. that is about 26 s. above their Labour. The Charge of maintaining the Poor us'd to be about 250 l. or 300 l. a Year. The Charge this Year in cloathing the Poor, upon placing them in the Workhouse, and buying Utensils, &c. is much greater than can be in future Years ; and yet the Overseer assures me, that he is confident the Parish will even this Year save 100 l.
The Children have a Form placed in the Alley, before the Seat of the Parish-Officers, to sit upon on Sundays ; but there is no particular Place as yet assign'd to the elder Poor at Church. The same report mentions plans for a workhouse to be set up in St Mary's parish. are farmed by a man who receives from the parish £14 a week. There are 42 persons, principally old women and children, under his care. Some Out-Poor receive £4 us, a week. The farmer is a stocking manufacturer, and employs the Poor in spinning worsted, etc. They work in the summer from 6 in the morning till 8 at night, and in winter from 7 till 9, meal times excepted. The house is not well situated, nor aired in the best manner, but appears to be kept very clean. The beds are of flocks, and much infested with bugs. A woman teaches the children to read and spin. Table of diet: Breakfast Sunday, Tuesday, Thursday, milk pottage or gruel ; Monday, Wednesday, Friday, broth and bread ; Saturday, milk pottage. Dinner-Sunday, Tuesday, Thursday, broth, meat and vegetables ; Monday, Wednesday, Friday, cold meat, vegetables and beer ; Saturday, bread, cheese and beer. Supper—every day, bread, cheese and beer. About £16 in different donations are annually distributed among the Poor of this parish. There are in Leicester 5 hospitals, in which there are usually about 200 Poor. The war has had no other effect on the manufactures of this town than by taking off a great number of hands. Several soldiers' families of course became burdensome. The manufactures of Leicester are sent to different parts of the kingdom and to America. Every parish in the town supports its own Poor. County of Leicester: All Saints (4), St Leonard's (2), St Margaret's (14), St Martin's (4), St Mary's (6), The Newarke, St Nicholas (3), The Castle View. The population falling within the union at the 1831 census had been 39,135 with parishes ranging in size from Castle View (population 149) to St Margaret's (23,954). The average annual poor-rate expenditure for the period 1833-5 had been £12,274 or 6s.3d. per head of the population. 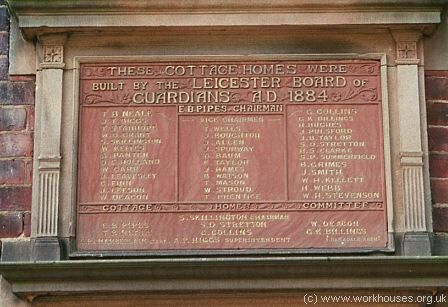 The new Leicester Board of Guardians had their first meeting on 12th July 1836 at the Guildhall, although subsequent meetings were held at St Martin's workhouse until a board-room at the new union workhouse came into use. Initially, the possibility was explored of retaining and upgrading the three existing parish workhouses at St Martin's, St Mary's, and St Margaret's, the latter being located on Humberstone Gate. However, it was calculated that the cost of a new building (about £6,000) less the proceeds of selling the existing buildings (£3,650) would be £650 less than the cost of improving the old buildings. A new single building was also expected to save about £300 a year in running costs. Eventually, towards the end of 1838, it was decided to build a new workhouse on a site on Sparkenhoe Street, at the north side of Conduit Street. In 1838, the Poor Law Commissioners authorised the union to spend the sum of £9,600 on a workhouse to accommodate 600 inmates. During 1837, before the new workhouse was ready, there was a depression in Leicester's hosiery trade and the Board of Guardians agreed not to impose the workhouse test but instead to continue allowing out-relief. This changed at the end of the year and, for the able-bodied poor at least, all that was offered was admission to one of the three interim workhouses in which segregation of the sexes was introduced. The strength of opposition to these caused a change of heart and out-relief was reintroduced. Another severe depression in the winter of 1841-2 resulted in around 5,000 claimants being give out-relief. In the spring of 1842, the Guardians tried to introduce a labour test where out-relief was given in return for daily manual labour, usually in the form of stone breaking. Violent riots resulted which were only quelled with military assistance. 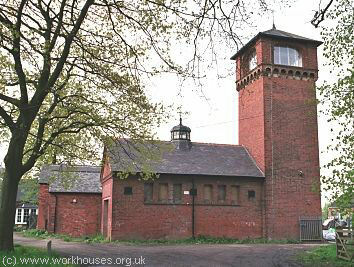 The new workhouse building opened in 1838. The architect was William Flint. A Leicester Guardian, William Parsons, had been a contender for the design but was felt to be ineligible because of his position on the Board. Flint's design was a variation on the hexagonal "Y" plan published by the Poor Law Commissioners in 1835. Leicester workhouse original layout, 1836. The entrance block at the west included a porter's lodge, waiting-hall, board-room etc. There was a tramps' ward at the north end. To its rear were male and female receiving wards on the ground floor, with a chapel above. The main wings of the "Y" radiated from the central supervision hub, and had day rooms on the ground floor with dormitories above. Workshops and service buildings such as the laundry were arranged around the outer perimeter, with a small infirmary at the east. In 1843, an investigation of the union's financial operations uncovered evidence of corruption amongst officials. As a result, the union's auditor, workhouse master, and two relieving officers were dismissed. In 1847-8, Leicester again suffered severe distress and unemployment with 19,000 people being relieved at a cost to the union of £17,000. A further attempt to introduce an outdoor labour test through the opening of a stoneyard again resulted in riots in May 1848. A suggestion to erect a much larger workhouse was thwarted by the election of an anti-poor-law Board of Guardians. However, by the end of 1848, the new board had come round to accepting this proposal. 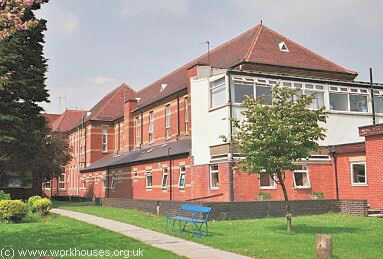 Leicester rebuilt workhouse site, 1888. Below is a view of the entrance to Leicester workhouse from around 1880. The rather wooden poses of the staff presents a suitably unwelcoming appearance. 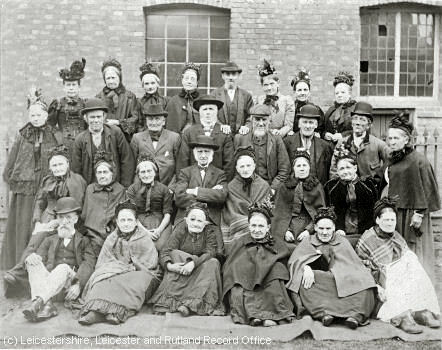 Leicester workhouse and staff, c.1880. © Leicestershire, Leicester and Rutland Record Office. Leicester workhouse and staff (detail), c.1880. The picture below shows a group of elderly inmates from the Leicester workhouse in about 1890. Since they don't appear to be wearing the workhouse uniform, this was presumably some special occasion, perhaps a summer outing. Leicester workhouse elderly inmates, c.1890. Many further additions and alterations were later made to the buildings. 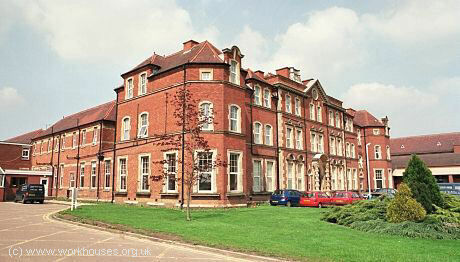 The site later became known as Hillcrest Hospital and was the main geriatric unit in Leicester until its closure in 1974. The former workhouse buildings were demolished in 1977. Today, just the workhouse former gateposts and fencing survive. 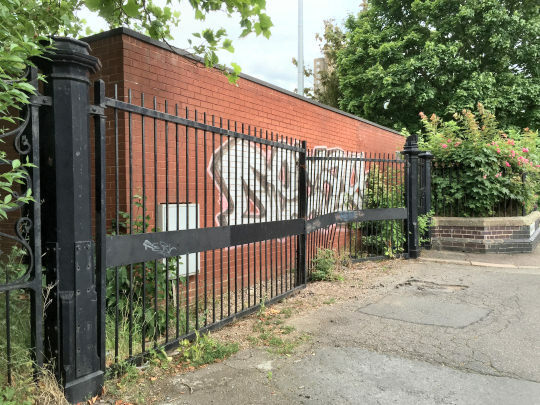 Leicester workhouse gateposts and fencing (not original gates). Leicester workhouse gateposts and fencing. In 1903, the foundation stone was laid for a new Poor Law infirmary on a 63-acre site at North Evington. 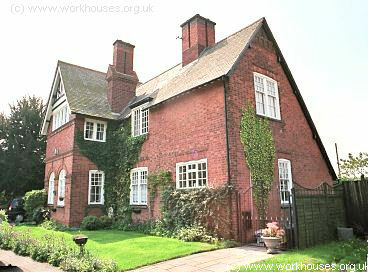 (The site was much larger than needed but left space for the possible future provision of a new workhouse.) The infirmary, which cost almost £90,000 in total, was designed by the firm of Giles, Gough and Trollope. It became known locally as "The Palace on the Hill". North Evington Infirmary site, 1930. 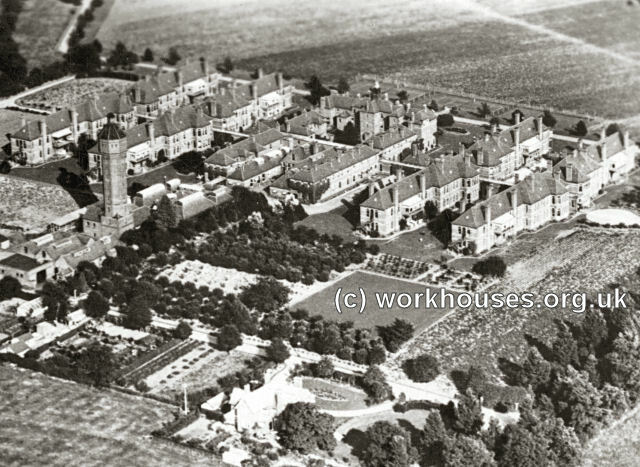 North Evington infirmary aerial view from the west, date unknown. The infirmary was officially opened on 28th September 1905 by Mr Arthur Kemp, Chairman of the Leicester Board of Guardians. It provided 512 hospital beds and took over the provision of care for the chronic sick section of the workhouse. A large administrative block at the centre contained offices, staff rooms, kitchens, and the operating theatres. The central block was flanked by male wards at one side and female to the other, all linked by a connecting corridor which, at 194 yards, was said to be the longest in England. Nearest to the centre were small receiving receiving wards, then a pair of two-storeyed double pavilions which provided a total of sixteen 24-bed wards. The wards were all named after municipal wards in Leicester. There were also separate blocks for imbeciles, epileptics and short-term lunatics. During the First World War, North Evington Infirmary was used as a military hospital. The number of beds was doubled, to 1010, and the first 100 war casualties were admitted on 9th May, 1915. In more recent times, as part of the National Health Service, the site became the Leicester General Hospital. 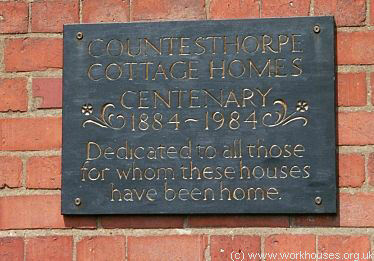 As well as the workhouse and infirmary, Leicester Union also set up a cottage home site on a 55 acre site at Countesthorpe. 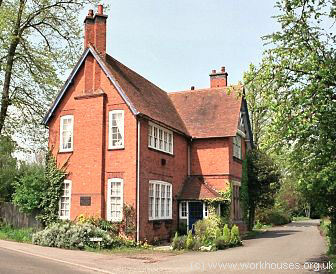 Cottage homes were established by a number of Unions, usually at rural locations, to provide accommodation for pauper children away from the workhouse. 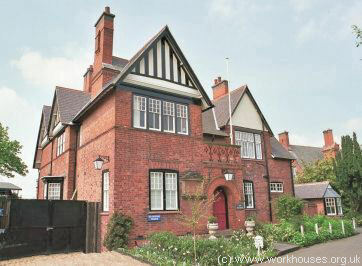 The homes, which could accommodate 280 children, cost £29,340, and were officially opened on November 26th 1884. Leicester Cottage Homes Site, 1904. There were eleven children's "cottages", nine of which held accommodated twenty-four boys or girls, and two of which held sixteen. Each home was under the supervision of a resident house-father or house-mother. The children contributed to household duties such as scrubbing the floor and preparing vegetables. As well as the cottages, the site had its own school, 20-bed infirmary, 10-bed isolation ward, workshops, laundry and swimming baths. All the children attended divine service in the school room on Sunday afternoon at 3pm. There was also a site Superintendent and Matron who oversaw the children's welfare and administered any corporal punishment that was determined to be required. Boys at the homes had their own band which occasionally performed at local functions. The picture below, taken at the homes' annual sports day in 1919, includes some band members with their instruments and uniforms — their hats bore the initials "CHB". Countesthorpe Homes sports day, 1919. On 24 November 1921, the homes received a visit from the Duke of York, the future George VI. The picture below also features the Chairman of the Homes' Committee, Henry Hancock, and the Clerk to the Guardians, Herbert Manefield. 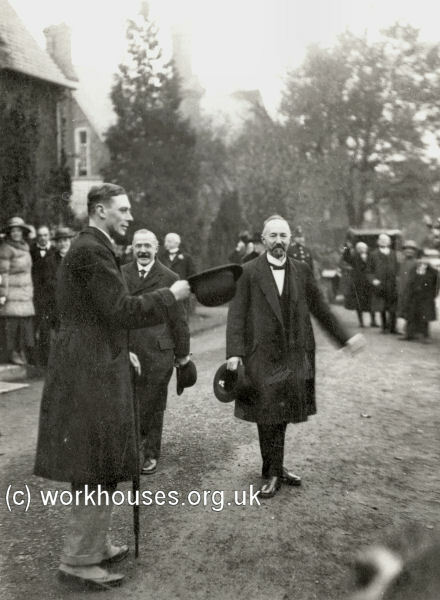 Countesthorpe Homes visit by Duke of York, 1921. The homes continued in use until the 1970s. After the last child left in 1974, one of the cottages was used for a period as a boarding house by the local Education Department. The cottages have now been converted for private residential use. A collection of photos of the cottage homes dating from the early 1900s is available on a separate page. As well as the cottage homes, the Leicester Union started housing some of its pauper children in scattered homes located around the city. These included houses at: 2 Dorothy Road, 50 Halstead Street, 86 & 109 St Saviours' Road, and 170 East Park Road. Each home housed between 10 and 12 children in the care of a house-mother. The children attended local schools. On 20th July 1908, a new receiving home for sixteen boys and sixteen girls was opened at Mill Hill Lane. Its construction cost £1,916 plus £1,000 for the site. The building also contained officers' quarters and sick rooms. The receiving home accommodated up to 32 children who were entering union care, giving them medical checks etc. before passing them on to one of the union's cottage or scattered homes. The premises later became The Oaks boys' home. The property is now in private residential use. 'The Lodge' at Mill Hill Lane provided a home for 20 'ins-and-outs' — children who were frequent short-term residents. 1912 Cottage Homes — Superintendent: William Harrison; Matron: Mrs Sarah Jane Harrison; Charles Beresford: Medical Officer; Schoolmaster: James Attenburrow; Assistant schoolmistresses: Miss Thirlby and Miss EM Ross; Infants' mistress: Miss Philips; Six trade teachers. 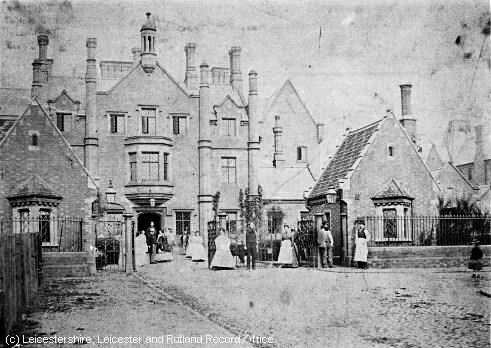 The Record Office for Leicestershire, Leicester and Rutland, Long Street, Wigston Magna, Leicester, LE18 2AH. Holdings include: Guardians' minutes (1836-1930); Births (1866-1930); Deaths (1866-1930); Admissions and discharges (1879-1973); Bastardy register (1844-87); Pauper index books (1875-1933); etc. Thompson, Kathryn M (1988) The Leicester Poor Law Union 1836-71 (Ph.D. Thesis). Thanks to the Record Office for Leicester, Leicestershire and Rutland for kindly allowing use of archive pictures. 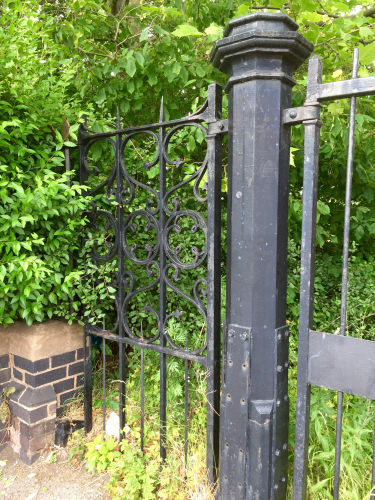 Thanks to Jeannette Sitton for pictures of gateposts.